University of Maryland's Engineers Without Borders (EWB) will be hosting the second annual University of Maryland ExPO: Engineering Skills Fair on Saturday, September 28, 2013 from 1 p.m. to 3 p.m. in the Kim Engineering Building. Student groups from all engineering disciplines will lead hands-on, interactive workshops on topics ranging from 3D printing and welding to automotive repair and power tools. The 15-30 minute sessions will give students an opportunity to engage with one another and learn skills applicable to both engineering and everyday life. Participating student groups include Maryland Sustainability Engineering, Steel Bridge, Concrete Canoe, Startup Shell, Society of Bioengineers, QUEST Honors Program, Terps Racing, Autodesk Student Experts, MESA, Sigma Phi Delta, Theta Tau, and more! Use your hands. Learn something. Experience engineering. 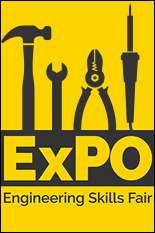 For more information about the ExPO and a complete list of workshops that will be available, visit the event's website.